"A contribution to the search for solutions to some important questions of my time and of all time." His work in this spirit followed three main reform themes inspired by his emerging general finalist philosophy for humanity. The first theme, which he developed in the late 19th century, was the necessity of individual economic responsibility in business and labour organisations. A century later, the current capitalist system, fundamentally flawed by people availing themselves of "limited liability" (the privilege of anonymity having gone or disappearing), has developed in such a way that from its base to its top decision making we now have generalised "irresponsible capitalism", so much so that recent weak efforts to regulate the financial sector at the margins can never seriously be expected to achieve a lasting correction. No major economic, legal or political observer since Henri Lambert has even noticed the existence of exorbitant privileges of limited responsibility, let alone challenged the adverse consequences of limited liability. Indeed, none of today’s better thinkers or political leaders even seems to be aware of them. 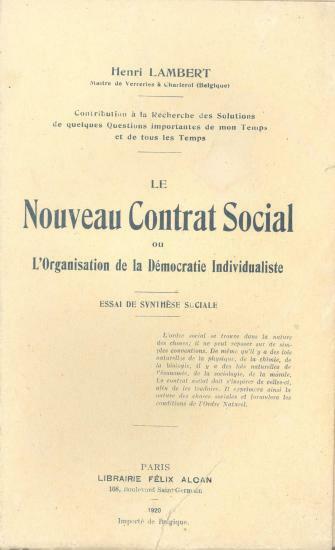 The second theme developed by Henri Lambert and appearing in parallel, is that of a truly thought out organisation for democracy and democratic electoral systems. Since the widening of parliamentary and electoral regimes dating from the late 19th century, various legislative bodies (Parliaments, Congresses, Chambers, and other more or less advisory bodies) have mostly been just special interest groups seeking to consolidate their positions, in constant conflict with one another. The general interest of the population is virtually ignored by these struggles between competing interests, and the deals and compromises inherent to these systems – some even pushed to the absurdity of extreme and paralyzing proportional representation. 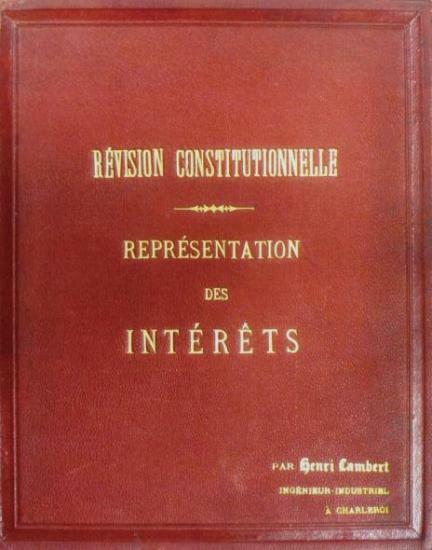 The designer of an original electoral system, conceived to create parliamentary entities necessarily geared to the general interest, and therefore more stable and better able to carry out major reforms in the general interest, Henri Lambert devoted himself from the late 19th century, and especially throughout the early 20th century, to promoting and seeking recognition of his electoral system. 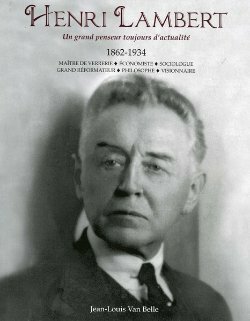 His effort seemed well under way in Belgium in 1914, but was abruptly halted by the Great War and then abandoned in the postwar period, lost under the thrust of socialism and simple universal suffrage, with purely proportional representation of voters’ ideological tendencies and parties, and the inevitable rise of "partitocracy". A century later, today’s various “democratic” legislative systems – almost everywhere lame, torn from within by conflicts of interest, and tainted by their funding sources – are in the greatest difficulty, and in fact incapable of initiating major reforms in society, despite great need for them in most countries. What thinkers of our time, what movement in political economy (a traditional discipline, but now almost abandoned) is today seeking to reform our supposedly "democratic" electoral systems so that they might promote the general and public interest? Finally, Henri Lambert’s third major theme was that of his truly tireless battle against the protectionism, economic nationalism and exacerbated national rivalries that became ever more serious, especially since the second half of the 19th century, at the approach of World War I, and then again as World War II approached. Faced with general incomprehension of the fundamental and decisive importance of economics for the relations between rival states, with the ignorance in economic matters of the main political leaders of his day, and even their lack of general intelligence, he nevertheless came close to a breakthrough of global significance at the highest levels of the American government when, in 1917-18, it was preparing the “Peace Treaty” which was to seal the end of World War I. Through his approach to Colonel House, chief advisor to US President Wilson, he had dared to hope that peace would be based on European and global economic disarmament and that President Wilson’s famous "14 Points" would have this as their first and most essential "Point". With Colonel House he had succeeded in introducing this “Point” (to begin with only in the eleventh position, and finally in third position) but not as the lead position. Subsequently, the Armistice was negotiated in November 1918 directly between the United States (President Wilson and Colonel House) and Germany (the Social Democrats) on the basis of the "14 Points". Henri Lambert proffered significant advice to Colonel House in this context. Tragically, however, President Wilson completely abandoned the "third Point" at the disastrous "Peace Conference" in Paris in 1919. Already weakened by vascular disease, overwhelmed by Clemenceau for the French and by Lloyd George for the Commonwealth and an infinite variety of claims from around the world, obsessed with his over-riding dream of a saviour "League of Nations", and very weakened politically in the United States, had he ever really believed in the capital importance of the "third Point"? His aura and authority in 1919 could nevertheless have imposed it on the ex-combatants at the end of the War. 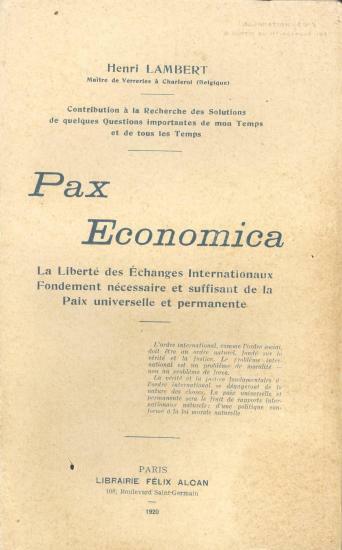 No economist or serious politician any longer doubts the importance of this fundamental economic goal for the realisation of peace among nations. 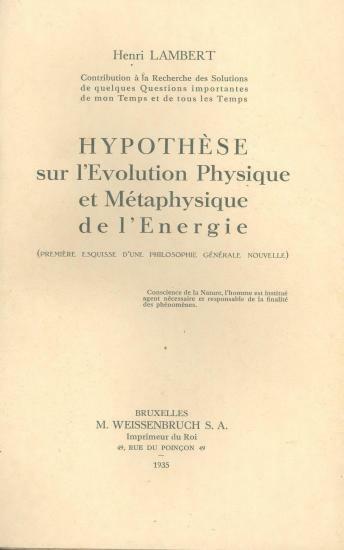 Last but not least, it should be noted that the tireless work of Henri Lambert on these three themes was based on his humanist, positivist, spiritualist and finalist philosophy, based on his very original and daring "Hypothesis", finally revealed in extenso by his son Valentin, and published post mortem in 1935. Thereby offered discreetly to the thoughts … of a very few … that work sets forth with a new clarity the possibility of a finality of purpose for humanity.